Varicose veins are treated by non-surgical methods. 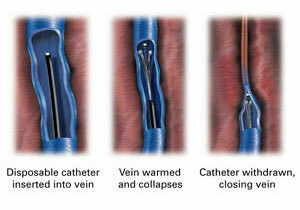 These vein procedures are performed by Dr Ian Little, a fellow of the Australasian College of Phlebology. We offer free initial assessments and can arrange easy payment terms. Endovenous laser ablation, Vnus Closure, VenaSeal or foam sclerotherapy are remarkably simple walk-in/walk-out office procedures. The safety and efficacy of these procedures to treat varicose veins are such that surgery for varicose veins will soon be obsolete. The information below does not replace a full consultation, we are very happy to see you for a free inital assessment with Dr Little at The Elements Medi-spa. This is a technique that involves placing a medicine in the unwanted veins, it is used for treating various vein conditions such as; varicose veins, reticular veins, spider veins of the leg, and also some fine facial veins. Varicose and spider veins are predominant in women and affect up to 40% of the population. Not only are varicose veins unsightly; sufferers endure symptoms such as aching, heavy, tired legs, throbbing, tingling, burning and cramps. In the latter stages of the disease process skin changes can lead to a rash and even skin ulcers. Treatment is effected by injecting a micro-foam into the vein, this medicine reacts with the inside of the vein and body reacts by shutting it down. The blood flow diverts back into the deeper, normal veins and improves the circulation. The procedure is virtually painless and therefore requires no anaesthetic. Treatments of varicose veins are followed by the wearing of compression hosiery for up to two weeks. Sclerotherapy has been a speciality treatment in Europe since the 1960's and was always thought as the treatment of choice for the smaller spider or thread veins, which are so common on the face and legs. However nowadays, with the help of ultrasound guidance to visualise the larger problem veins and with advent of foam medicine, even the largest of varicose veins are treated safely this way. Sclerotherapy is a 30 minute, virtually painless procedure with huge advantages over surgery, including no general anaesthetics, no stitches, no hospitalisation and no time off work. It is a walk-in, walk-out procedure with costs about half of surgery. Using ultrasound map to guide, the Doctor will insert a catheter into the appropriate vein. Then you will be injected with an anaesthetic to numb the leg, this also empties blood out of the vein and protects surrounding tissue. Energy in the form of radiofrequency (Vnus closure®) or laser light (EVLT) creates a heat ideally of 85 degrees emitted from the catheter to heat the vein wall. This causes it to shrink and close, redirecting blood to healthier veins. This procedure takes around 1 hour. Free no obligation consultations and assessments, book NOW.